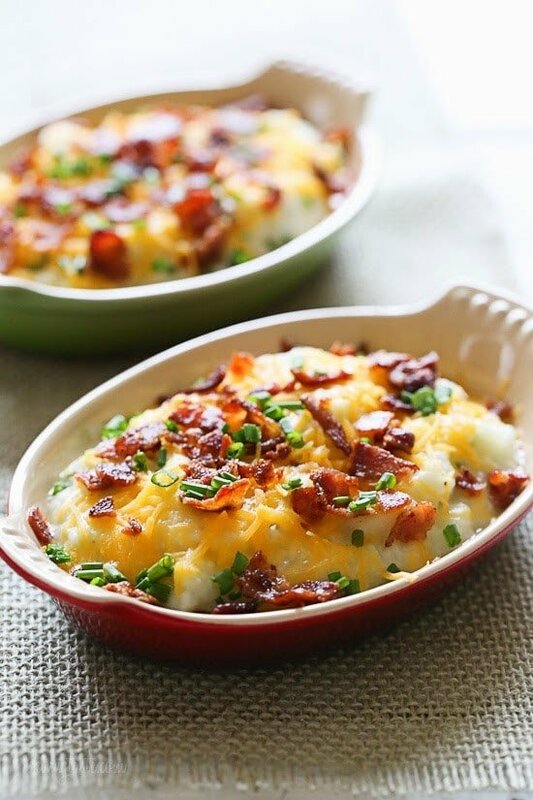 Cheesy mashed cauliflower made with a touch of whipped butter, buttermilk, garlic and herbs and topped with cheese and bacon – low-carb, low calorie and keto, but you’ll swear it’s totally indulgent! A few weeks ago I stopped to eat lunch with the family at Pizzeria Uno. I ordered a burger and somehow the waiter talked me into getting the loaded mashed potatoes – OMG! Yes, it was a moment of weakness but some of my best ideas come from those moments. This version is so so good, lower in carbs, gluten-free, Keto and makes the perfect side dish to any meal. Mashed cauliflower is a great low-carb, lower calorie alternative to mashed potatoes. To make it, boil the cauliflower until tender then puree with an immersion blender along with buttermilk, milk or dairy-free milk. You can add chives, garlic, sour cream and butter. If you don’t have buttermilk you can use a little milk and sour cream in it’s place. 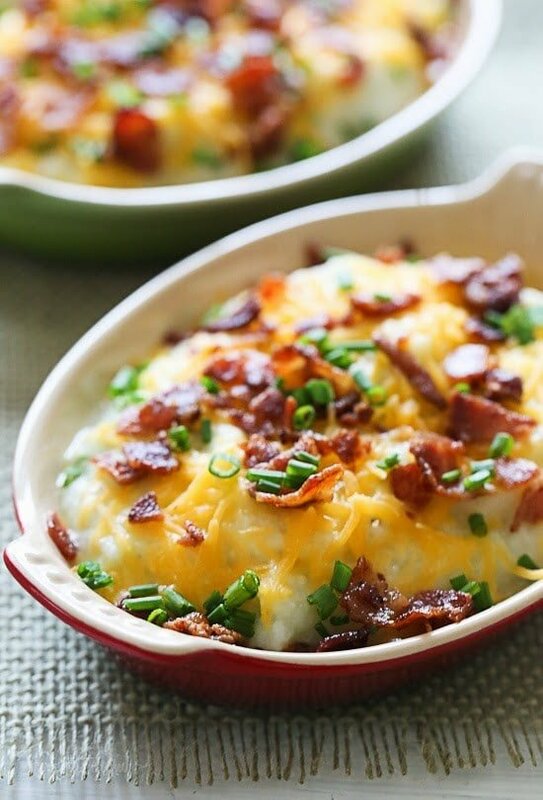 Creamy mashed cauliflower made with a touch of whipped butter, buttermilk, garlic and herbs and topped with cheese and bacon – low-carb, but you’ll swear it’s loaded with tons of calories! Cook the bacon in a skillet until crisp; set aside on a paper towel then crumble. Fill a large pot with water, bring to a boil and add cauliflower and garlic. Boil until the cauliflower is soft, about 15-20 minutes. Drain, and return to the pot. Add the buttermilk, butter, salt and pepper to the cauliflower and purée with a hand blender. If you don’t own a hand blender, a regular blender would work fine as well. Mix in 1 tbsp of the chives and transfer to 4 individual casseroles (3/4 cups each) or one 8 x 8 casserole dish and top with cheddar and crumbled bacon. Bake in the oven until the cheese melts, about 5 minutes then top with remaining chives. No need to complicate this review, it was DELICIOUS and SIMPLE and is definitely on my list for future meal sides ideas!!!! Thanks! OMG Gina!!! Yet another superior recipe. We had these with your Salisbury Steak and Mushroom Gravy. My husband was skeptical at first but was amazed at the taste and consistency. Of course he added “I wouldn’t expect anything less” LOL. We can’t thank you enough for all the hard work you put into helping us maintain a healthy life style. Cheers!!! To get a perfect mashed potato-like consistency, steaming the cauliflower is the way to go. There was no excess liquid whatever. Pureeing after steaming in a food processor, I was easily able to adjust texture and thickness with the buttermilk. Everything else the same. I used 6oz ramekins for portions and refrigerated overnight. About 30 min in the oven at 350 the next day and this was the perfect accompaniment to a beef short rib dinner for my son-in-law’s birthday. At least the “potato” dish was healthy! Top notch! Great way to eat cauliflower and so easy to make! Big hit with the family and guests! This recipe was great> I used my pressure cooker to cook fresh cauliflower. It was even better the next day. It was a side dish to the pork tenderloin with spinach, mozzarella and proscuitto, which is another of my favorites. 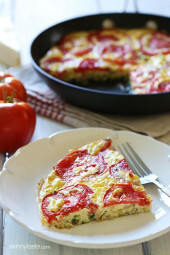 Can you use riced cauliflower to make this? You’ve managed to boil out many of the nutrients while finding a new way of ingesting bacon, cheese and butter. It does sound delicious for some, but make no mistake, I would eat this or a recipe like this about 2-3 times per month maximum, as a flavor-packed, supersalty reward for a very hard workout and week of healthy eating. I am on the new WW freestyle and you noted that recipe is 2 FF points i just used the WW phone app and its coming up as 4 points. Am i misunderstanding something? Are you using the recipe builder? I made this tonight! It was delicious. Even my husband loved them! I made this tonight! It was fabulous. If you steam the cauliflower, it come out perfect. Thank you for the recipe! Dumb question. Does the garlic stay in just to cook the cauliflower or does it get blended in too? We love garlic so I’d like to leave it in but don’t want to ruin the recipe. 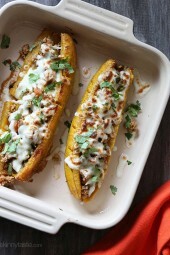 I love your recipes and really appreciate this blog you’ve created! Do you have to use buttermilk? Do you think I would be able to substitute half and half or heavy cream and it would still come out the same? This was epic. Family loved it and was finally convinced that low carb is not a death sentence. Thank you!! Lol, glad they liked it! Can I use 1% milk I stead of butter milk because I forgot to get the buttermilk….,,??? Do you find that fresh cauliflower works better or worse than frozen? Yes, I always use frozen. I am using Google fresh does it make a difference….??? Fantastic! I forgot to add the butter, and didn’t miss it! Made this tonight for dinner with baked sole – it was fantastic! Delicious. Just now made it for lunch. Made the full recipe for 4 servings – 2 of us are devouring it all! I used the potato masher to give a rough mash. My husband didn’t know he was eating cauliflower. I’ll be making this again soon. Thanks for the post. Gina, we tried this recipe tonight. It is so delicious ! Thank you for developing all the wonderful recipes you share with us. I have your cookbook. Thank you, thank you! I tried this recipe tonight and OMG it’s delicious and quite filling. I feed into my WW phone app and the Smart Points on this came up 3. I pretty much only make your recipes these days because I can count on you for a tasty healthy food. I made this for the first time tonight something out buttermilk for plain 0% Greek yogurt but followed the rest to the T. Absolutely fabulous and I have no problems with watery cauliflower. Hey I tried making this recipe but it turned out very watery. Tastes great but very watery. Do you have any suggestions to make it more creamier? Is there something else to use rather than buttermilk? Ok, this is definitely a WOW. I actually said "oh my goodness" every time I took a bite. I can't believe it's only 2 SP! I added a bit of extra cheese (to equal 15g per serving), and even so, it came out to 3sp. And since we are garlic lovers, I doubled the quantity. With all of those lovely flavors, you could have sworn they were potatoes. Definitely going into my regular rotation. can i use turket bacon instead? What is whipped butter? In Ireland and have never heard of it…. I made this but roasted the cauliflower instead, I think it helped it not be as watery. Can you make this dish a day ahead for Thanksgiving? Thank you for including the points plus value for Weight Watchers. This helped me work this into my weight plan using the WW program. This is such a great and easy recipe, thank you for sharing it, I will be making this a lot. This makes a nice presentation but I thought the cauliflower base was bland. Next time I might add some dry mustard, nutmeg, hot sauce, pepper flakes, pepper jack cheese or romano cheese. I might also substitute low fat sour cream for the buttermilk. So much easier than peeling potatoes and healthy, too! My husband and I both enjoyed this as a side dish. It has all the creaminess and comfort that mashed potatoes provide without all the carbs! Will definetly add to our meal plan rotation. You wouldn't know it was cauliflower if you weren't the one cooking! Super easy and great flavor. Served this as a side to a simple grilled pork tenderloin and it was wonderful. I substituted crisped prosciutto for bacon since we never have bacon in the house anymore. Really delicious…everyone raved about it. Next stop: testing on my picky nephews! I made this dish on Sunday…love it! Consistency is so similar to mashed potatoes. Easy to make and delicious! Another great recipe, Gina! I made this last night. Loved it! Quick and easy to put together. My cauliflower was 21 oz so I used a bit less than 1/3 cup of milk (I only had 1%). I can't wait to serve it and not tell anyone it's cauliflower! Amazing!! Thanks for sharing! I made this last week and just couldn't get past the texture of the cauliflower mash, it was very thin:(. It didn't taste bad but the texture was hard to get past. Gina you did it again!!! 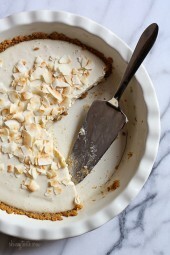 This was sooo good and a big hit with the family…only thing I'll do is double the recipe because everyone wanted more! This was delicious! I made this for an early Christmas dinner with our family and everyone thought it was potatoe 🙂 Thank you for the great recipe. Have a merry Christmas! This was great. All the kids ate it, and I knew I'd love it. Gina, I made this last night and it's awesome! Another one of your recipes we love. I substituted Kefir for the buttermilk since that's all we had on hand and it worked great. Thanks a bunch. Food processor!!! I didn't even think of that! Thanks for mentioning, Brownie. I was going to write and ask how you didn't get cauliflower everywhere using a hand blender. It still came out pretty good, just more chunky. I will definitely try a food processor next time! I made this and it was OUTSTANDING!!! Seriously good! My husband is not a cauliflower lover could not believe it was cauliflower! I'm having it for lunch today – thank you for another great recipe! I love your regular mashed cauliflower recipe and this is a really nice way to amp it up. Ate the leftovers for breakfast this morning. Quite yummy. Wow! Yum, this one gets a pin. Thanks. I'm really loving all the creative cauliflower dishes out there. Can you make this ahead of time and then finish it in the oven the next day? Love your recipes! Just wondering if you were planning on making the switch to Epicurious or a similar site since Ziplist no longer supports recipe boxes (boo!)? I really don't enjoy pinning recipes as much since they tend to get lost in the shuffle! Have you tried Plan to Eat? I absolutely love it. Hmm, no, I might have to look into that! Thanks for the tip! And if I don't have buttermilk? Make your own! Milk + lemon juice. These look so good with the bacon and buttermilk. I do have a problem with getting rid of all the water after cooking and draining. Sometimes when I mash them they are still watery even though I drain for a long time. Any suggestions? I"ve had the same problem. The last time I actually spread the cooked caul. out on a clean dish towel, rolled it up and twisted and squeezed as much water out as possible. I'd like to find a less messy way to do that. I actually use my Potato ricer to get water out of cooked spinach. If you have one it may work for the cauliflower. Try steaming! I found that steaming rather than boiling eliminates the problem of excess water and results in a firmer mash. Looks so awesome. I am thinking of the holidays, could you prepare a day ahead, refrigerate and then bake the day of the party? Thank you for sharing these recipes, I've learned so much, and you make me look like I can cook! I was wondering this also. Would love to make Christmas Eve for Christmas Day. Did you make this ahead? I’m trying to figure out if I could do this today for Easter dinner tomorrow. I would also like to know if frozen cauliflower can be used. Will the cooking time need to be adjusted? Hi I was wondering if you could use frozen cauliflower? This looks so comforting and delicious. Do you think I could substitute regular milk for buttermilk? It's good for us to know you are human and have weak moments like anyone else!! LOL I like the sound of this. Pinning it!! Love the cauliflower aspect–so comforting and still with some good-for you ingredients. Yum! Such great recipe to try this weekend. When I have made just plain Faux mashed potatoes (aka mashed cauliflower) I cook in veggie (or chicken stock) it makes it taste even better. Just make your own or use the low salt. I purchased several of your books for Christmas gifts. I am SO excited to give out in a few weeks. Thank you for all you do! What are those little casserole dishes you are using? If you have a big box store in your area you can probably buy them there. I bought similar items (just plain white restaurant style) at a big box store last year and just love them. They were CHEAP and being made for food service they have a super finish that soaks clean so easy no matter what you bake in them. Will it make a big difference if I use a tablespoon of regular butter opposed to whipped? Thanks so much for all of your amazing recipes- I have been making your recipes for the past eight months as part of my weight loss plan for my wedding and I am proud to say that I getting married this Saturday 30lbs lighter :-). Looking forward to making this one for Xmas! Congrats to you! That's fantastic! That's wonderful, makes me so happy!!!!! Have a beautiful day! Congrats on both the weight loss and the upcoming wedding.